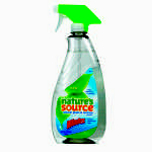 Light-duty, nonammoniated cleaner cuts through dirt, grease and grime on windows, mirrors, appliances and more. Readily lifts soil and grease from windows, glass counters, windshields, mirrors and more; dries quickly without streaking or hazing. Mint fragrance. Ready-to-use formula cleans windows, glass and mirrors, as well as stainless steel, chrome, aluminum, ceramic, marble, Plexiglas® and most plastics. Nonammoniated and nonstreaking. Dries fast. Simplifies cleaning. Cleans and disinfects multiple surfaces. Dries streak-free. Hospital-grade disinfectant. One nontoxic, premeasured tablet mixes easily with water to make 2-1/2 gallons of window cleaner. Effective yet environmentally friendly. Easily removes smoke and grease without leaving a film.